Jennifer Lee is the founder of the Natural Carnivore. She is a Carnivore Nutritionist, a Natural Rearing Dog Breeder, Author and Reiki Master. Jennifer has long relied upon species appropriate nutrition and natural care to promote and maintain the health of her animals. She earned certification in Carnivore Nutrition from the American Council of Animal Naturopathy in 2012. ​The Natural Carnivore is dedicated to teaching how to prevent illness and promote health in animals using natural, gentle and time tested methods based on the practice of Naturopathy. "I have been involved with animals in one form or another for my entire life. My first pet as a young child was a hamster named Kermit and it has only snowballed from there! 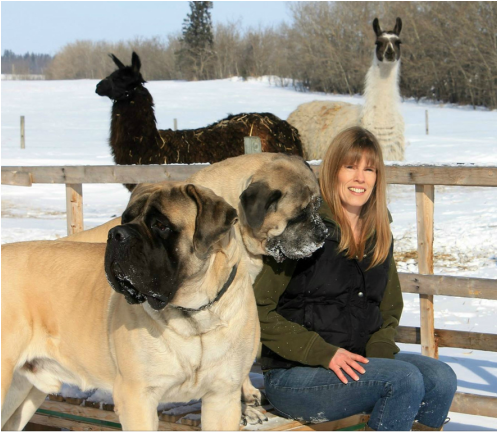 We currently share our rural Alberta home with a group of delightful dogs, one cat, a small flock of chickens and several llama's. We have been involved in breeding, raising and exhibiting Mastiffs since 2005. Animals have taught me that by following nature's cue's we are able to live in harmony with our environment and embody true health and vitality".